I’ve been sort of lazy about posting lately. For the last week, I’ve been on semi-“vacation” which means catching up on writing projects and things around the house between wrapping up my summer field work and preparing to begin fall banding next week. It’s pretty stressful to me not to have any true down time, but I’ll just breathe into a paper bag in the corner and get on with this post. One of my goals this summer was to learn more about the other flying objects in my small urban yard. Aside from birds, I know a lot about Odonata (damselflies and dragonflies) as I do a lot of survey work with them, and am handy with Lepidoptera (butterflies and moths) as well. My friend Mark is a Hymenoptera expert (bees, wasps, ants) , and last year identified a photo I’d taken of a wasp outside my dining room window as a species new to the state! We co-authored a paper on it after he obtained a specimen. This inspired me to get to know this order better. And Diptera (flies) seemed neglected, so I thought I’d toss them in the mix. I targeted species in my yard that for the most part were pollinators, stayed still long enough to be photographed, and were large enough (>3 mm) and distinctive enough to be identified at least to family. Here is a sampling of some of the more interesting flies I’ve encountered. If you let me know you like this sort of stuff, I’ll do a few more posts like this over the rest of the summer. Yes, I did say flies. 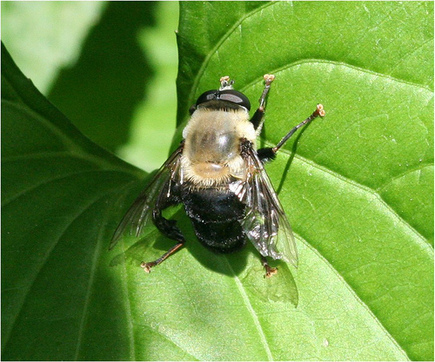 This is not a bumblebee, but a fly in the family Syphidae, Mallota bautias. Syrphids are a wide and varied family of mostly bee and wasp mimics which I think are incredibly cool and interesting. Here’s another Syrphid, Spilomyia alcimus, a fantastic yellowjacket mimic. Not all bee and wasp mimics are Syrphids. 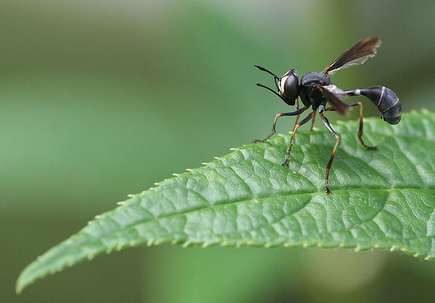 This potter wasp mimic is a thick-headed fly in the family Conopidae, Physocephala tibialis. They are internal parasites of bumblebees, laying their eggs right into the abdomens of worker bees; the larvae apparently do not kill the bees. This one was hanging around a plant that always had bumblebees present. 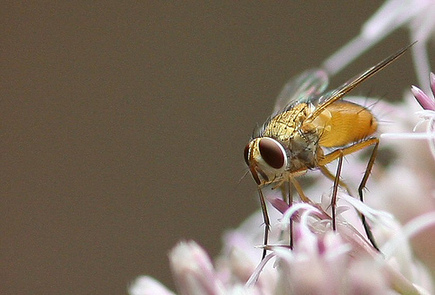 Another well-known family of parasitic flies are the Tachinidae, the second largest family in the order. All larvae are parasitoids of other insects. Many species specialize in particular hosts, but every other insect order has some tachinid that parasitizes it. A lot of tachinids are sort of non-descript. Yellow is not as common a color, and I think this is in the genus Genea. 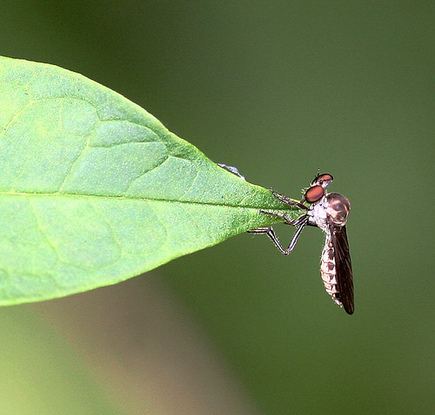 Feather-legged flies are a subfamily of Tachinidae. I have photographed one species in the yard, but this one, which I found at a local park, is way cooler. It’s Trichopoda pennipes, whose larvae are internal parasites of true bugs (Hemipterans) such as stink bugs. They’ve been introduced to Europe for pest control. I’ve been unable to find out the function of the feathery setae on the tibiae. If anybody knows, please comment! A couple years ago, I did a post on the hanging thief, a fly in the charismatic family Asilidae, or robber flies. Not all robber flies are as large and distinctive as hanging thieves. This one, in the genus Holcocephala, is about 5 mm long, and feeds on gnats and other small insects. I’ve photographed over 30 species so far (that I’ve identified), and an equal number of Hymenoptera. Soon, the asters and goldenrods will be in bloom, and I expect to find more new species. Let me know if you want to see more! I would enjoy seeing more like this. I don't know all that much about insects. Great post, info. & photos! Very interesting. Can we see more, lady of the flies? That's all the encouragement I need. I'll do some wasps next! Very nice post! Interesting, umm – feet? Toes? (Whatever) on the first one. Very interesting post and great clear photos. I just noticed that our Hydrangea paniculata grandiflora is blooming now and attracts a multitude of flies, bees and wasps. I'm trying to photograph them but the wind and their frenzied activity makes it extremely difficult to get a good shot. Any tips on insect photography? I saw a particularly interesting sight, a large mosquito like insect carrying a honeybee in either it's mandibles or front legs couldn't determine which. I was in too much of a rush to run for the camera but when I returned it was gone. I think I need to wear the camera around my neck when I go outdoors. I shoot with a 105 mm macro lens, but some smaller point-and-shoots have decent macro capacity. I get few usable shots out of the many I take because I don't use a tripod, and the magnification of macro magnifies all movement, as you've discovered. A higher shutter speed helps; I often shoot at ISO 400. Any higher and the graininess is a little hard to get rid of. Most of the summer, I walk around the yard with a camera at least a half-dozen times a day to see what I can find. And I always have a small camera with me wherever I go! I certainly recommend BugGuide…as it is what I use to help me identify many of these insects. I do go through the ID requests and help out with the dragonflies, since I know them best. Down here in NC, I often have Dance Flies, Rhamphomyia sp. The wide legs of the flies resemble the elytra of the lycids extended in flight. 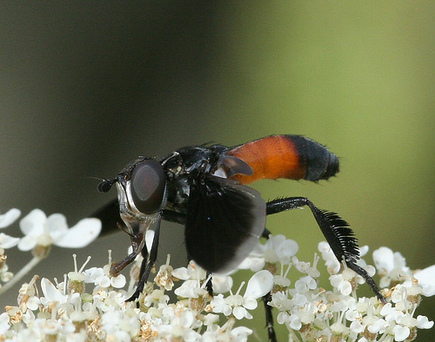 The flies have orange eyes, and with the dark bodies, resemble the dark, orange-marked lycids quite well. This is not obvious until you see the two in flight. Lycids are chemically-protected, so it sure smells of Batesian mimicry, or perhaps Mullerian. So, to make a short story long, my speculation is that the feathery edges of Trichopoda's legs is part of some sort of mimicry, perhaps of a beetle or a hymenopteran. Might make a good essay! 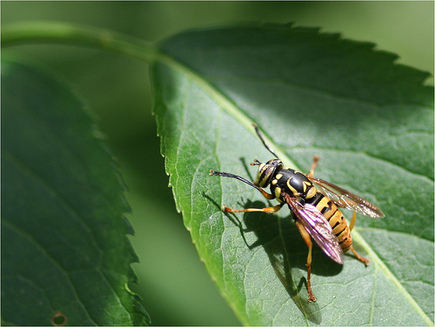 The yellowjacket mimic appears to be using its front legs to mimic the antennae of a yellowjacket. It is interesting that the evolutionary ball should roll down that groove rather than the one where the antennae of the fly are modified. And this behavior in flies seems pretty common, too, doesn't it? I can think of several other wasp/bee mimics I've seen it in.